Surrounded by rugged landscape ripe for adventure, whether you want to get on the water or into the fells, there is something for everyone. 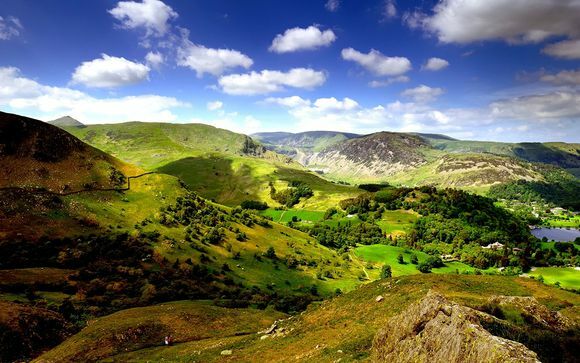 Between the hotel and Ullswater is a sheep field which slopes gradually to the rocky shore of the lake. Next to it are peaceful, well- tended gardens – the perfect spot for a gentle stroll or an al-fresco cup of tea. The Dalmain mansion and gardens, two or three miles from the Pooley Bridge end of Ullswater, have been in the Hasell family since 1679. Visitors can stroll through the property to discover fascinating interiors and historic parkland. Homemade food is served in the Mediaeval Hall Tearoom. The Historic Home of Lord and Lady Inglewood – full of fine furniture, tapestries and portraits, whilst the abundant grounds include a walled garden, topiary terraces and a woodland walk. Having been abandoned 70 years ago, Lowther Castle and Gardens is undergoing a restoration programme designed to preserve the rich wildlife that moved into the ruins and vast gardens. Open to visitors every day, guests will delight in the Lakeland Bird of Prey Centre within the walled garden of the Castle. This medieval Castle was founded in the early Thirteenth Century – visitors can get lost in the maze of passageways and spiral staircases. The Castle is great to explore, whilst the riverside grounds provide the perfect picnic spot. The Hotel offers 19 bedrooms, one restaurant and several comfortable, intimate shared spaces. The Hotel’s exceptional views are matched by the quality of service provided. This offer is based on a Standard, Superior or Deluxe Room. 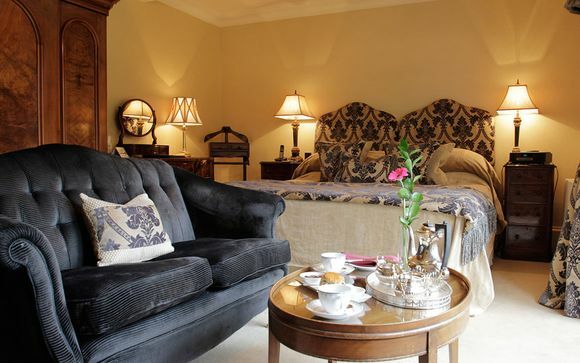 Superior Rooms are tranquil, spacious rooms with lake or garden views, with underfloor heated bathrooms and a King Size, Super King Size or Twin beds. Superior Rooms come en-suite with Freeview TV, Bose radio/CD player, Wi–Fi, telephone, fruit, mineral water alongside tea and coffee making facilities. Guests can also help themselves to a fluffy bathrobe, hair dryer and ironing board. Standard Rooms are comfortable and cosy, with underfloor heated bathrooms and a double bed. Standard Rooms come en-suite with Freeview TV, Bose radio/CD player, Wi–Fi, telephone, fruit, mineral water alongside tea and coffee making facilities. Guests can also help themselves to a fluffy bathrobe, hair dryer and ironing board. No two Deluxe Rooms are the same, but visitors can expect features such as a four-poster bed, a private balcony or a twin aspect. Deluxe Rooms offer lake views, lounge areas and roomy bathrooms. These rooms come en-suite with Freeview TV, Bose radio/CD player, Wi–Fi, telephone, fruit, mineral water alongside tea and coffee making facilities. Guests can also help themselves to a fluffy bathrobe, hair dryer and ironing board. This offer is based on a bed and breakfast stay. Just for you: guests can enjoy a 3 course fine-dining dinner. Guests are offered a daily full Cumbrian Breakfast. Rampsbeck takes great pride in its food, with head chef Ben Wilkinson trained in Michelin-starred restaurants. The hotel restaurant boasts two AA Rosette-awards – quality always comes first, with seasonality and local provenance a close second and third. The result is sophisticated dishes that dazzle in their simplicity. Serene yet unhushed space where guests can have a dinner of up to five courses showcasing the best of the chef’s cooking. The menu changes regularly but always includes some Cumbrian fare, such as Lakeland venison and Herdwick Hogget. Serving lunch and light bites throughout the day in the drawing room, hall and bar lounge. These meals are simple dishes emphasising the flavour of individual ingredients. Fresh daily preparation ensures the hotel can cater for any dietary requirement. Overlooking the gardens to the lake and fells beyond, the private dining area facilitates up to 16 people – the perfect spot for hosting an intimate occasion with family and friends. Choose from menu suggestions or design a menu unique to yourself. Working wonderfully with the rhythms at Rampsbeck, guests can take time over tea, scones and cake after a languid walk in the fells of a trip to the lake.